Now dozens of bears are about to relax for the first time in their lives. Thousands of bears are in bear bile "farms" right now, hooked up to machines that painfully drain their gallbladders of bile - which is believed in some cultures to be a cure-all but has no proven medicinal value at all. 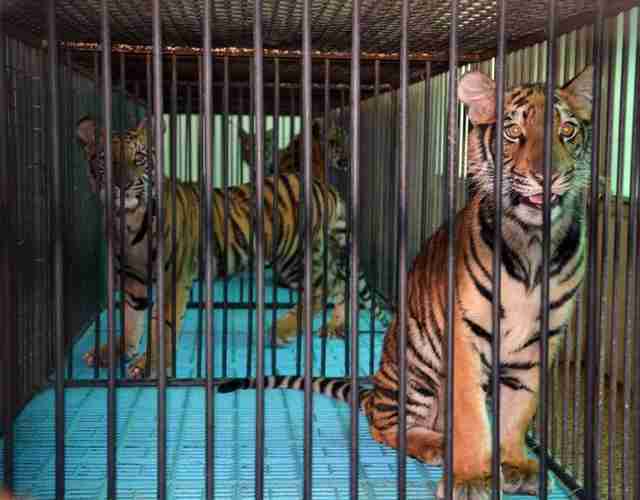 At other farms, thousands of tigers are bred to be killed so their skins, bones, teeth and claws can feed demands on Asian markets. But one country is promising to stop these barbaric practices for good. As the CITES (Convention on International Trade in Endangered Species) conference kicks off this week in Johannesburg, South Africa, representatives from the Democratic Republic of Laos said that they intend to close down all bear bile and tiger farms in their country, according to Wildlife Friends Foundation Thailand (WFFT). Laos suffers from rampant illegal trading in wildlife parts because of its position near China, which represents much of the demand for bear bile and tiger products. As part of the new effort to end these farms, one of "the most horrific bear bile farms" is currently getting a visit from the founder of WFFT, Edwin Wiek, to figure out how to get it shut down as soon as possible, and how to bring over 40 bears to the Laos Wildlife Rescue Center, where they will find sanctuary and lifelong care. "A combination of weak laws, poor enforcement and official complicity in Laos allows the illegal wildlife trade to openly flourish," a 2015 report by the Environmental Investigation Agency said. But this latest announcement suggests a renewed commitment to shutting down these barbaric establishments for good in Laos - and conservationists are hopeful. Many conservationists will be watching to make sure Laos follows through on its promise - and sets an example for other countries. "All eyes now are on China, Thailand, Vietnam and other countries," Debbie Banks, head of the EIA's Tiger Campaign, said in a statement. Now, WFFT will up its efforts to build homes for the bears they rescue from some of the worst bile farms on earth. "A serious fundraising campaign will need to take place to raise over $200,000 needed to build new facilities for over 40 bears currently kept at the farm," the organization wrote this week. You can help them build new homes for the bears in need of rescue here.